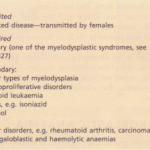 Red cell precursors pass through several stages in the bone marrow. The earliest morphologically recognizable cells are pronormoblasts. Smaller normoblasts result from cell divisions and precursors at each stage progressively contain less RNA and more Hb in the cytoplasm. The nucleus becomes more condensed and is eventually lost from the late normoblast in the bone marrow, when the cell becomes a reticulocyte. Reticulocytes contain residual ribosomal RNA and are still able to synthesize Hb. They remain in the marrow for about 1-2 days and are released into the circulation, where they lose their RNA and become mature red cells (or erythrocytes) after another 1-2 days. Mature red cells are non-nucleated biconcave discs. Nucleated red cells normoblasts) are not normally present in peripheral blood, but are present if there is extramedullary haemopoiesis and in some marrow disorders (see leucoerythroblastic anaemia. About 10% of erythroblasts die in the bone marrow even during normal erythropoiesis. Such ineffective erythropoiesis is substantially increased in some anaemias uch as thalassaemia major and megaloblastic anaemia. 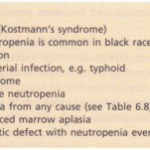 Erythropoiesis is controlled by the hormone erythropoietin. The gene for erythropoietin on chromosome 7 codes for a heavily glycosylated polypeptide of 165 amino acids. Erythropoietin has a molecular weight of 30400 and is produced in the peritubular cells in the kidneys (90%) and in the liver (10%). Its production is mainly regulated by tissue oxygen tension. Production is increased if there is hypoxia from whatever cause, for example anaemia or cardiac or pulmonary disease. Erythropoietin stimulates increase in the proportion of bone marrow precursor cells committed to erythropoiesis and CFU-E are stimued to proliferate and differentiate. Increased ‘inappropriate’ production of erythropoietin is also seen in patients with renal disease and neoplasms in other sites resulting in polycythaemia. Hb performs the main functions of red cells of carrying O2 to the tissues and returning CO2 from the tissues to the lungs. Each normal adult Hb molecule, Hb A, has a molecular weight of 68 000 and consists of two u and two f3 polypeptide chains (U2f32) which have 141 and 146 amino acids respectively. Hb A comprises about 97% of the Hb in adults. Two other Hbs, Hb A2 (u282) and Hb F (U2’Y2)’ are found in adults in small amounts (1.5-3.2% and <1%, respectively). 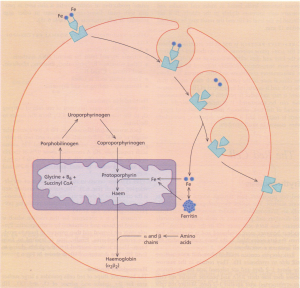 Hb synthesis occurs in the mitochondria of the developing red cell (Fig. 6.2). 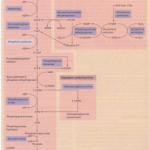 The major rate-limiting step is the conversion of glycine and succinic acid to 8-aminolaevulinic acid (ALA) by ALA synthetase producing porphobilinogen. Vitamin B6 is a coenzyme for this reaction which is inhibited by haem and stimulated by erythropoietin. Pyrrole rings are formed and then grouped in fours to produce protoporphyrins. Finally, iron is inserted to form haem. Haem is then inserted into the globin chains to form Hb. The structure of Hb is shown. The biconcave shape of red cells provides a large surface area for the uptake and release of O2 and CO2. Hb becomes saturated with O2 in the pulmonary capillaries where the partial pressure of O2 is high and Hb has a high affinity for O2. O2 is released in the tissues where the partial pressure of O2 is low and Hb has a low affinity for O2. The four haem units in Hb molecules successively unload O2 in the tissues and as they do the f3 chains are pulled apart allowing the entry of 2,3-diphosphoglycerate (2,3-DPG). This causes the affinity of Hb for O2 to decrease and improves delivery of O2 to the tissues. Most molecules carry no O2 or are fully oxygenated. This is responsible for the sigmoid shape of the oxygen dissociation curve. Hb is efficient for oxygen transport largely because the steepest part of the curve occurs at the partial pressures of O2 which occur in the tissues. The oxygen affinity of Hb is expressed as the Pso, which is the partial pressure of O2 at which 50% saturation occurs. When oxygen affinity increases, the oxygen dissociation curve shifts to the left and the Pso falls and VIce versa. surface receptor on developing red cells. The oxygen dissociation curve is influenced by 2,3- DPG, which is an intermediate in red cell glycolysis, the pH, the concentration of CO2 in the red cell and the structure of Hb. High concentrations of 2,3-DPG or CO2, a low pH and certain Hbs such as sickle Hb (Hb S) shift the curve to the right, thus decreasing oxygen affinity. 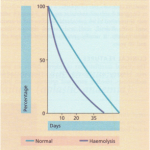 A shift in the curve to the left occurs with Hb F which is unable to bind 2,3-DPG and some rare abnormal Hbs where erythrocytosis may result from the increased oxygen affinity and decreased release of O2 to the tissues. A summary of normal red cell production and destruction is given.